Digital Worshiper: I've Been Infiltrated! I don't know how it happened or why, but Prodigal Jon over at Stuff Christians Like must have gotten a copy of my preaching calendar. Granted, the preaching calendar isn't under lock and key, but I have to wonder, "Why me?" The evidence first presented itself upon arriving from church today. I sat down to read my fun blogs (my ministry blogs can wait until Monday), and what did I see? Prodigal Jon flaunting his recently-discovered knowledge of my preaching plan. Prodigal Jon clearly knows that today I preached sermon #50 from the book of Mark. Seriously. I started preaching from Mark on May 20, 2007. Today's sermon was from chapter 11 verse 12-26. Just wait, it gets better. Mark 11:12-26 deals with one of the more famous events in the life of Jesus Christ. 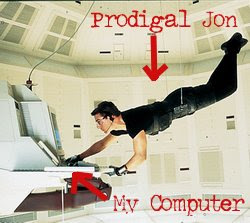 And what do you suppose Prodigal Jon's other post from yesterday was? You have to see it to believe it. I'm onto you, Prodigal Jon! Seriously though, all of you need to go over and subscribe to his blog, "Stuff Christians Like." It's a fun blog to read and really makes us laugh at ourselves. that is hilarious. Honestly, that is great. And yes, I did infiltrate your sermon calendar. Thanks for dropping buy, Jon. Keep up the good work over there!